Have Korean tacos gone the way of the cupcake, or the ‘bacon-on-everything’ trend? 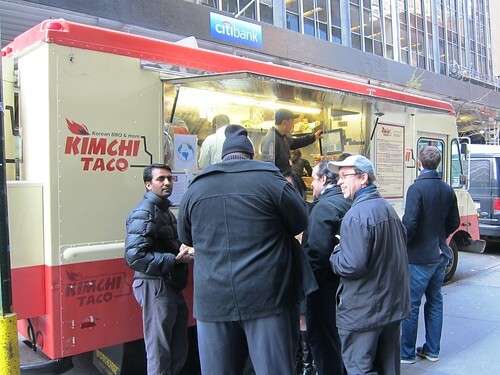 We at Midtownlunch are certainly guilty of perpetuating the hype, whether it be stalking Café Duke’s Korean tacos or getting maybe a little too excited for the Korilla BBQ truck. So when the Kimchi Taco Truck broke into the food truck scene earlier this year, I made it a goal to eat my way through the menu and save the tacos for last. A couple of weeks ago, Brownie beat me to the Kim-Cheesesteak and rice cakes, but I recently had a chance to try their kimchi bowls and couple of their side dishes. As it turns out, like the Kimchi Taco Truck’s Kim-cheesestak, their other non-taco options also warrant a visit to the truck. Their menu dabbles in a lot of different culinary themes, most of which call for mashing Korean flavors into classic American comfort foods. But perhaps the truest Korean item on the menu, is their ‘Kimchi Bowl’ ($8), which would be recognizable as dup bap in Korea – simply a meal composed of a form of protein and vegetables over rice. This dish isn’t ground breaking, as you could procure a similar lunch at your average K-town restaurant for about the same price. 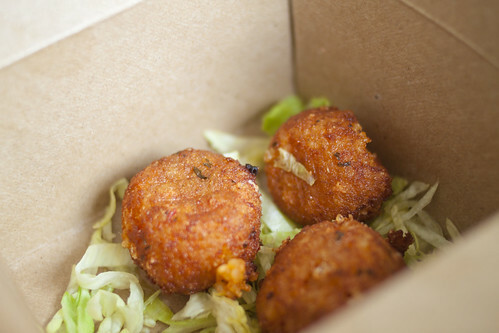 The fact that they serve something this fresh, filling and this tasty out of a food truck – that’s your game changer. For the rice was fresh, sticky and fragrant, the bulgogi warm, meaty, juicy, with the appropriate amount of carmelization and heat. There’s a cucumber pickle spear and a small salad of pickled radish for added crunch and zest. And the kimchi – powerful enough to raise noses in the elevator as you make your triumphant return to your desk – well fermented indeed. 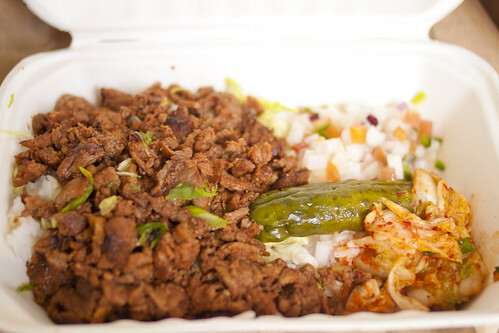 According to the Kimchi Taco Truck website, the kimchi is produced in-house, using Chef Youngsun Lee’s grandmother’s recipe with gochugaru (red pepper powder) imported from Korea. A meal that channels Grandma’s home cooking from a truck? I swoon. If for some reason, the kimchi bowl doesn’t fill you up, their side dishes shouldn’t be ignored. Brownie seemed to like their spin on ddeokbokki, and their Italian-Korean mashup of kimchi’d arincini ($3) is also a winner in my book. At $1 per precious and petite arincini, it’s a pricey snack, but an enjoyable bite of food – pleasantly creamy, delicate, and spiked with just the slightest tingle of kimchi notes. At $4, the BBQ nachos are a slightly better value as a snack. This Korean take on the all American classic junk food was something that breaks a lot boundaries, and perhaps shouldn’t work on paper. And the idea for something this primitive, yet shrewdly marvelous, could surely only be conceived under the influence of combustible psychoactive substances. 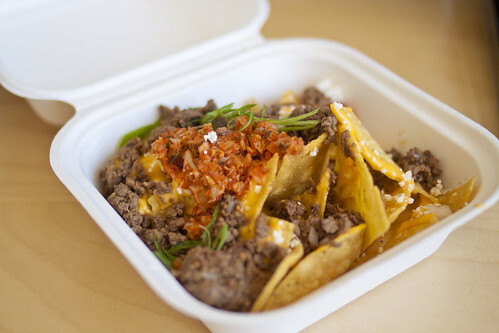 They scatter more of that juicy bulgogi, crumbles of cotija cheese, shreds of scallion and a scoop of finely chopped kimchi over a pile of your standard tortilla chip. Of course it wouldn’t be a ‘nacho’ without melted cheese product; that highly processed but comforting stodge that food snobs love to hate (but still secretly love). This dish is fun, it’s low brow, and it’s delicious. As I waited in line, I overheard conversations from my fellow lunchers and worried banter about what to order. There was gossip about the perceived messiness of the cheese steak. The gentlemen in front of me had his heart set on the tacos, only to jettison that idea at the window and order the bowl instead; I doubt he regretted that decision. Although the truck’s namesake fare may grab your attention, the other dishes at the truck, while less showy, are more than worthy of your lunchtime attention. They are supposed to be parked on 52nd & 6th today, but you’ll want to check their twitter account or the ML Twitter Tracker before heading out. Posted by Chris H. at 9:30 am, April 13th, 2011 under Kimchi Taco Truck. I waited on line for 45 minutes today (was early to work), and with 15 people still in front of me…..just left. The Kimchi Bowl is OK. I got it with pork. It wasn’t overly delicious or overly filling. Some of the spicy stuff they give with it is OK. I think the Chosun Bowl at Korilla is much better. It’s got better flavor with more food and a better overall meal.